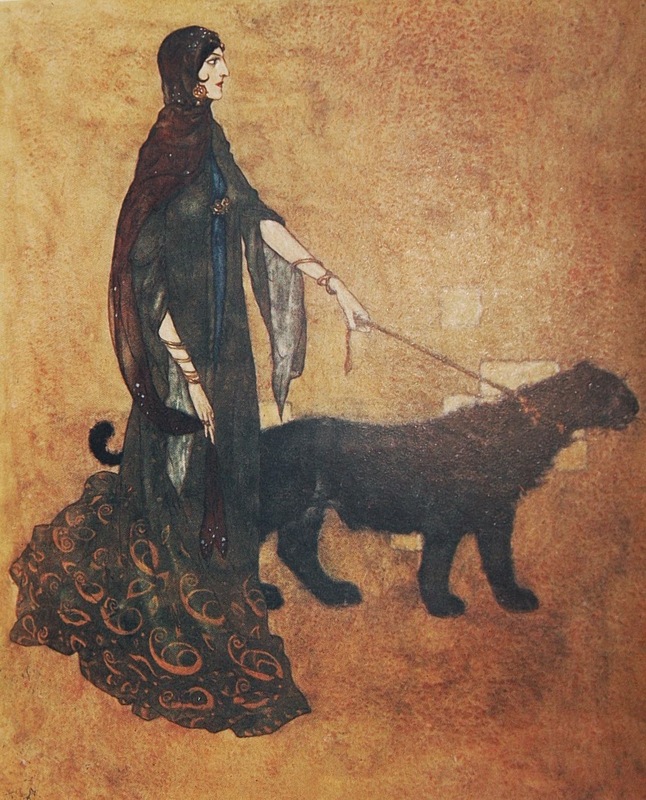 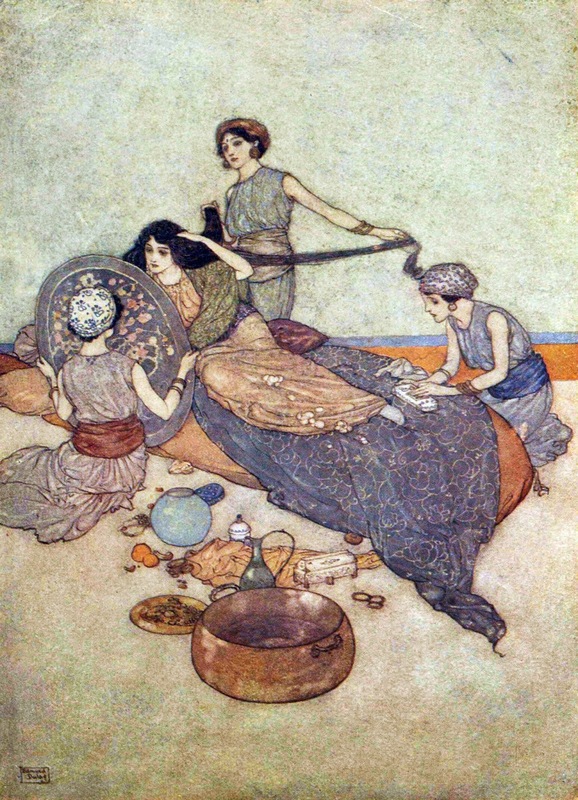 Edmund Dulac (born Edmond Dulac 1882 – 1953) was a French magazine illustrator, book illustrator and stamp designer. 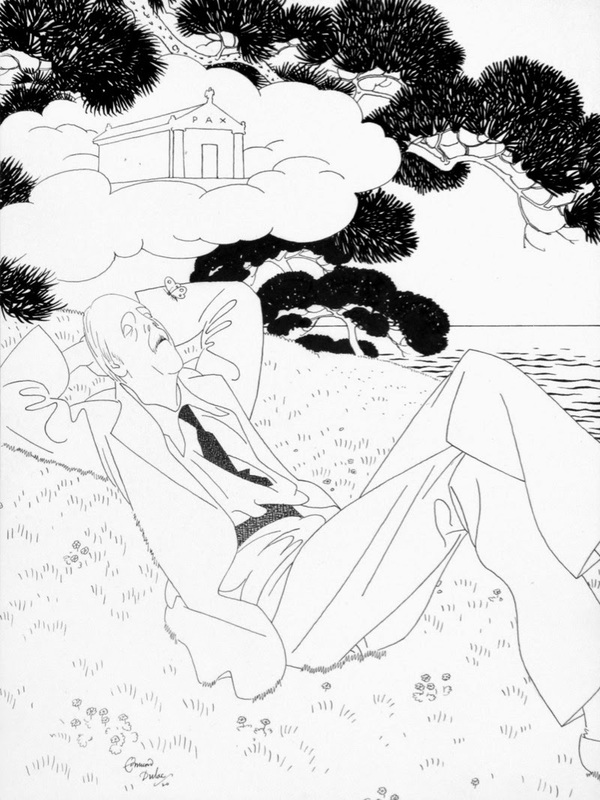 Born in Toulouse, France, he began his career by studying law at the University of Toulouse. 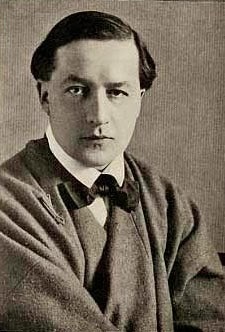 He also studied art, switching to it full-time after he became bored with law, and having won prizes at the Ecole des Beaux Arts. 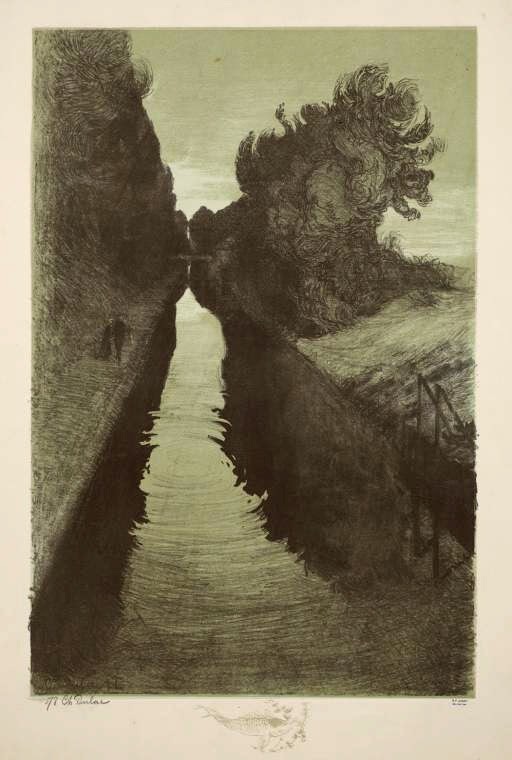 He spent a very brief period at the Académie Julian in Paris in 1904 before moving to London. 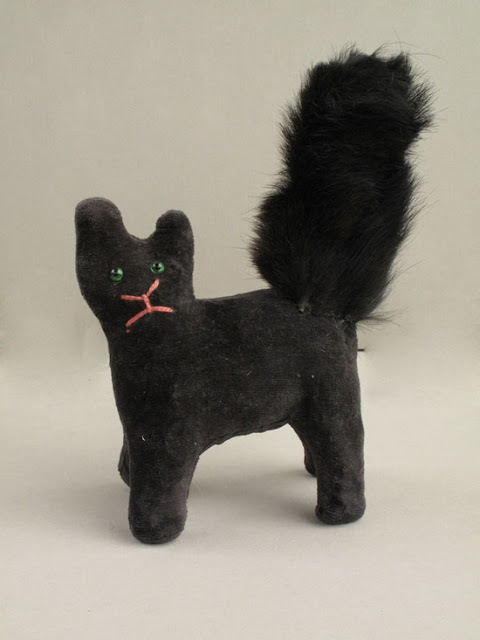 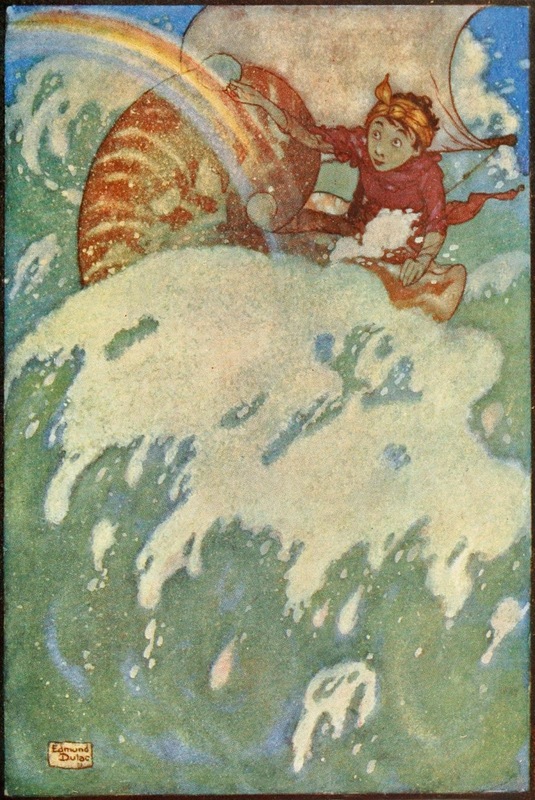 He was commissioned by the publisher J.M. 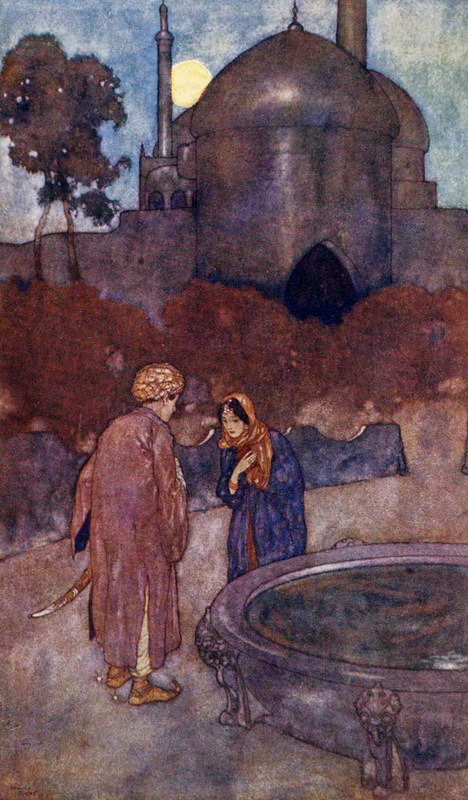 Dent to illustrate Jane Eyre. 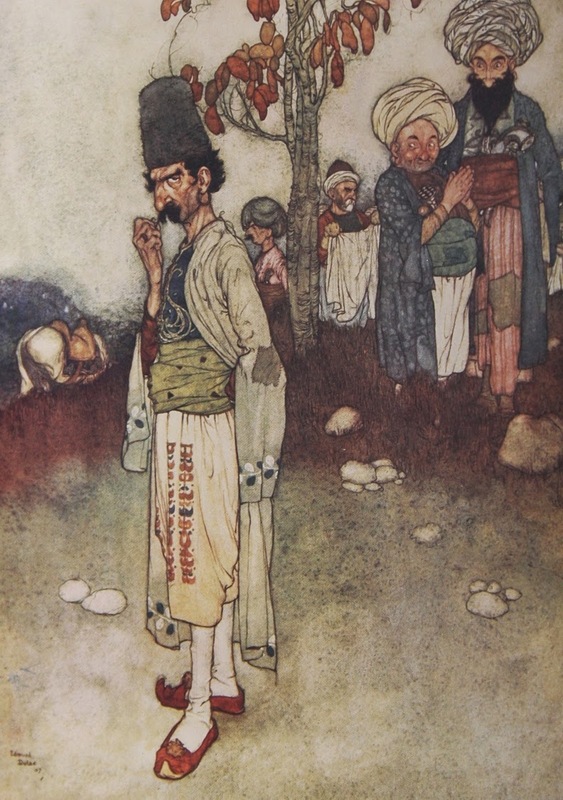 He then began an association with the Leicester Gallery and Hodder & Stoughton; the gallery commissioned paintings from Dulac which they sold; the rights to the paintings were purchased by Hodder & Stoughton, who used them as illustrations in illustrated books, publishing one book a year. 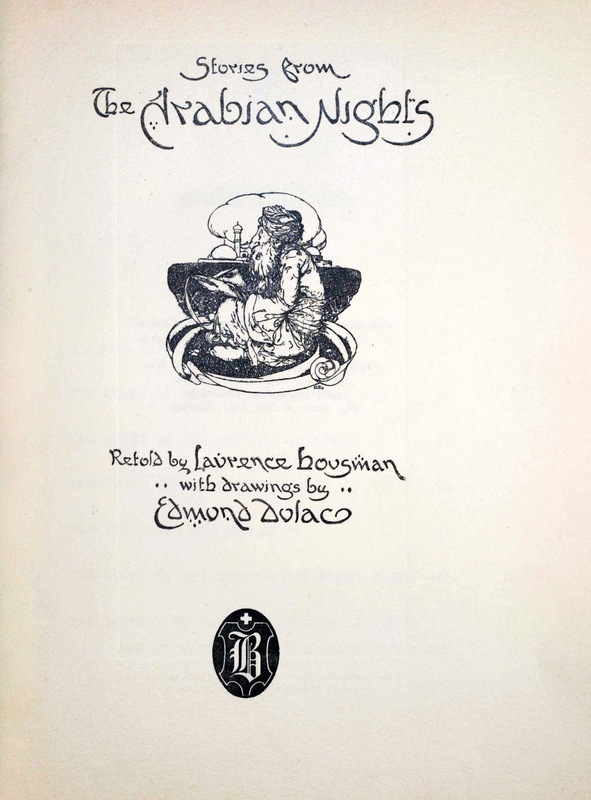 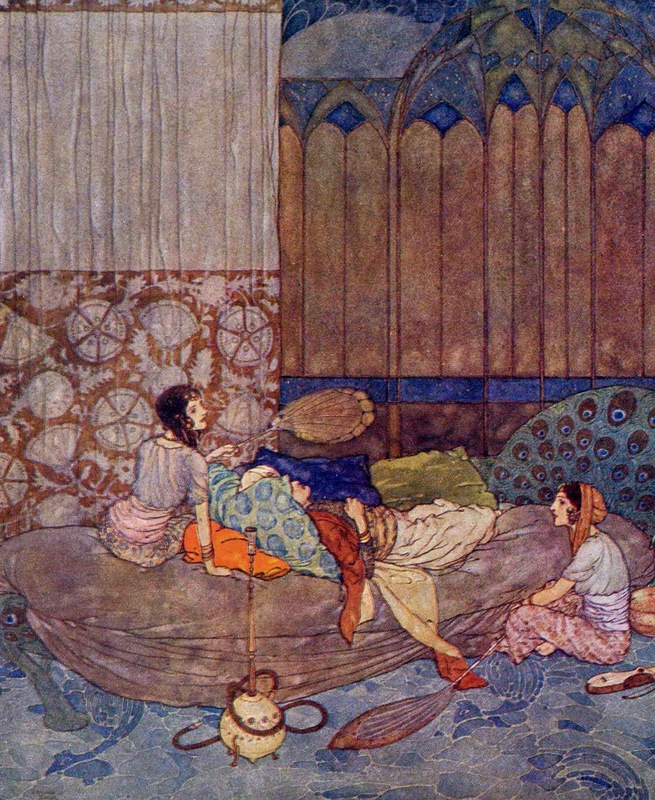 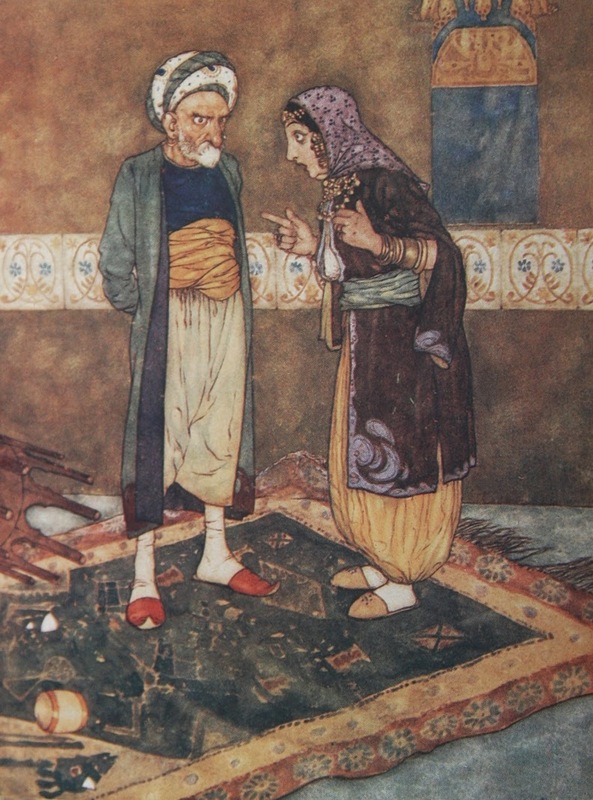 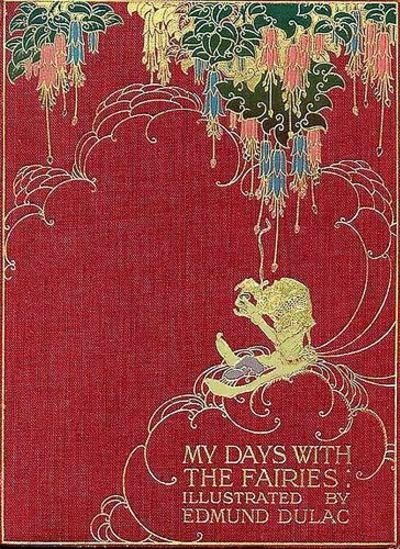 Books produced under this arrangement by Dulac include Stories from The Arabian Nights(1907) with 50 colour images; an edition of William Shakespeare’s The Tempest (1908) with 40 colour illustrations; The Rubàiyàt of Omar Khayyam (1909) with 20 colour images; The Sleeping Beauty and Other Fairy Tales (1910); Stories from Hans Andersen (1911); The Bells and Other Poems by Edgar Allan Poe (1912) with 28 colour images and many monotone illustrations; and Princess Badoura (1913). 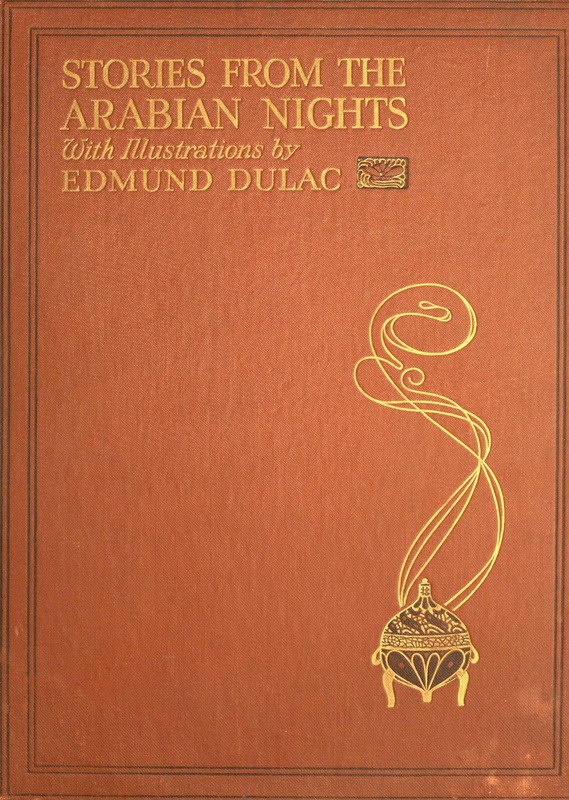 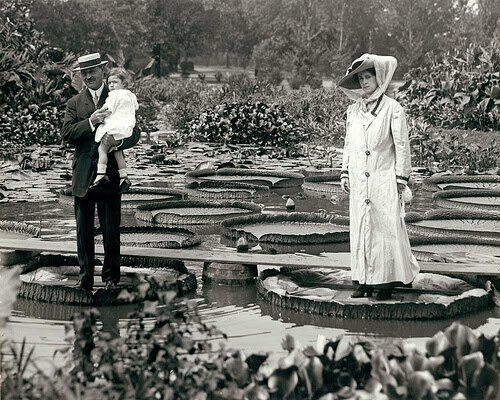 Dulac became a naturalised British Citizen in 1912. 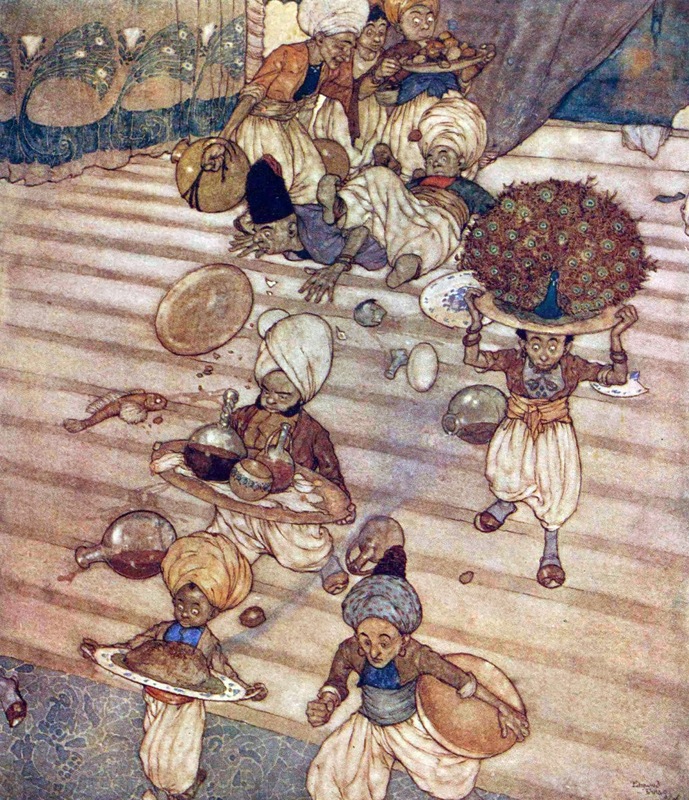 During World War I he contributed to war relief books, including King Albert’s Book (1914), Princess Mary’s Gift Book, and, unusually, his own Edmund Dulac's Picture-Book for the French Red Cross(1915) including 20 colour images. 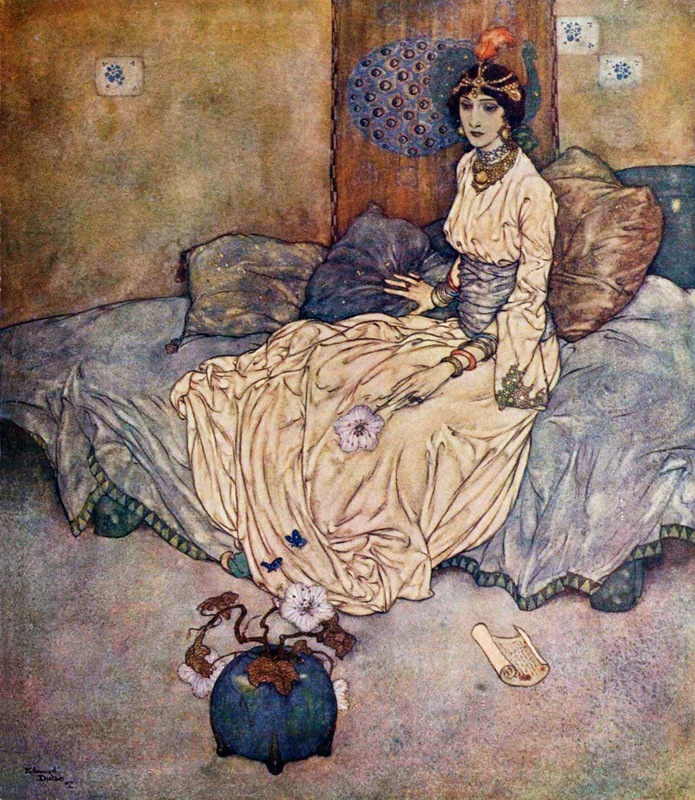 Hodder and Stoughton also published The Dreamer of Dreams (1915) including 6 colour images - a work composed by the then Queen of Romania. 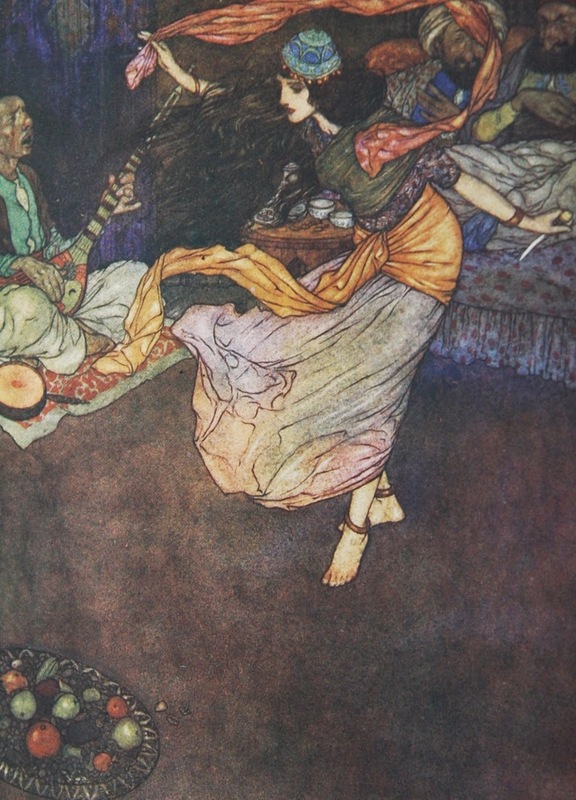 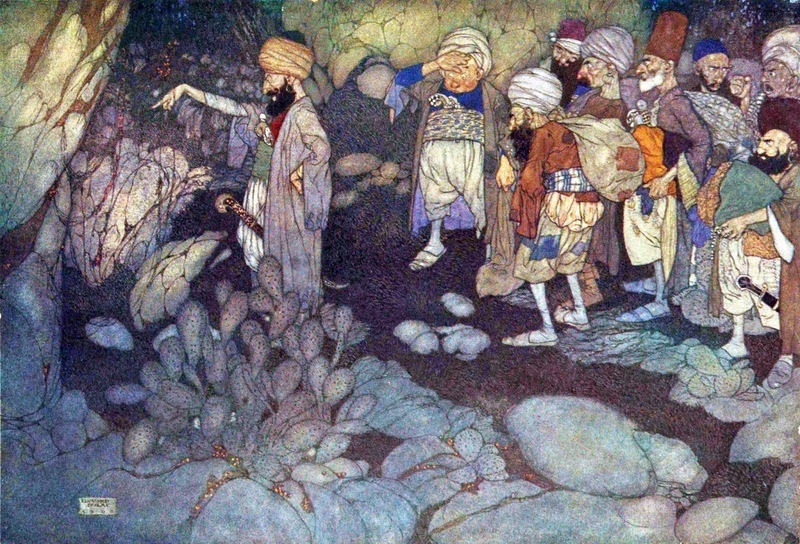 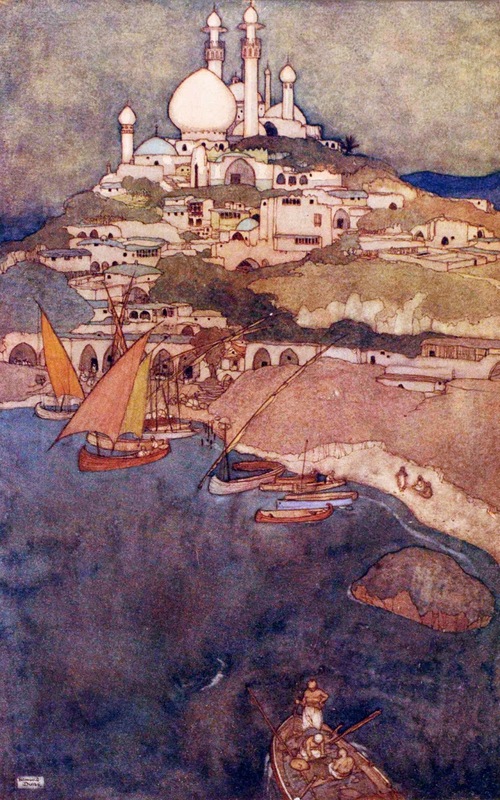 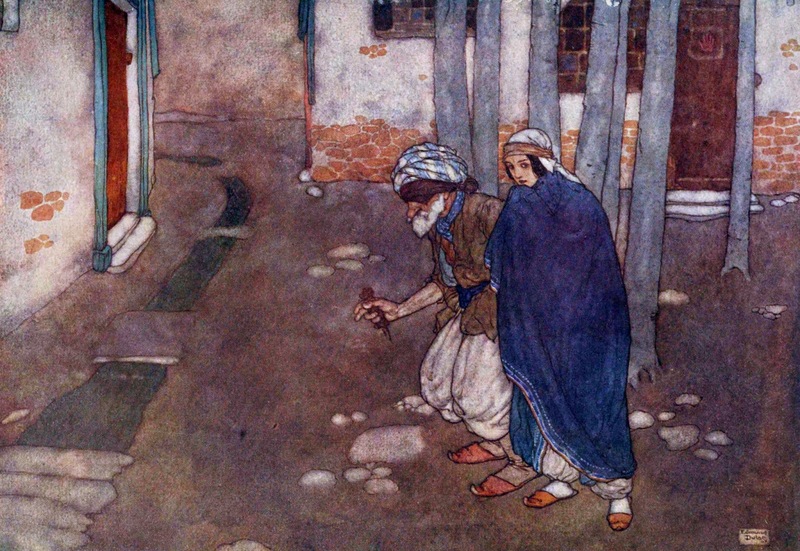 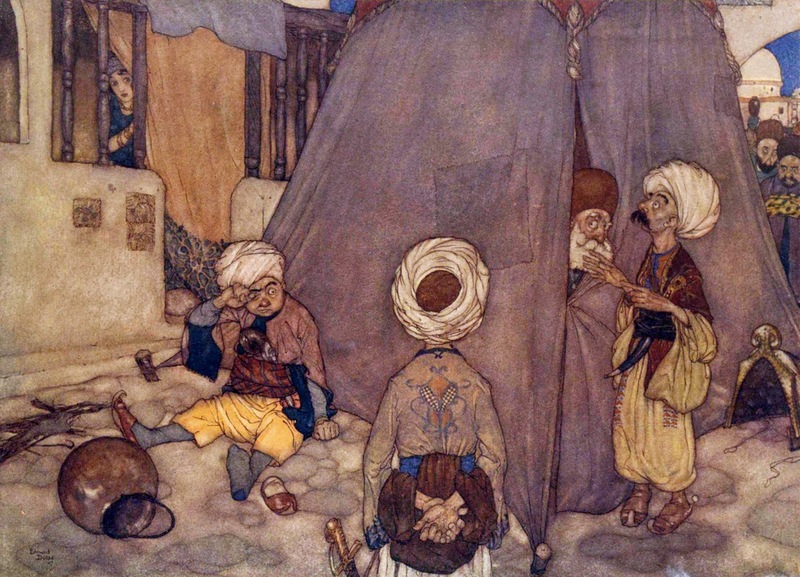 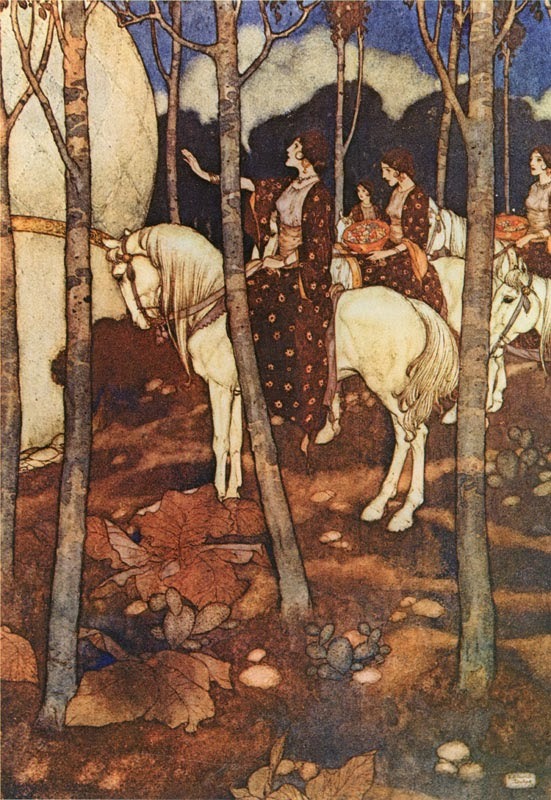 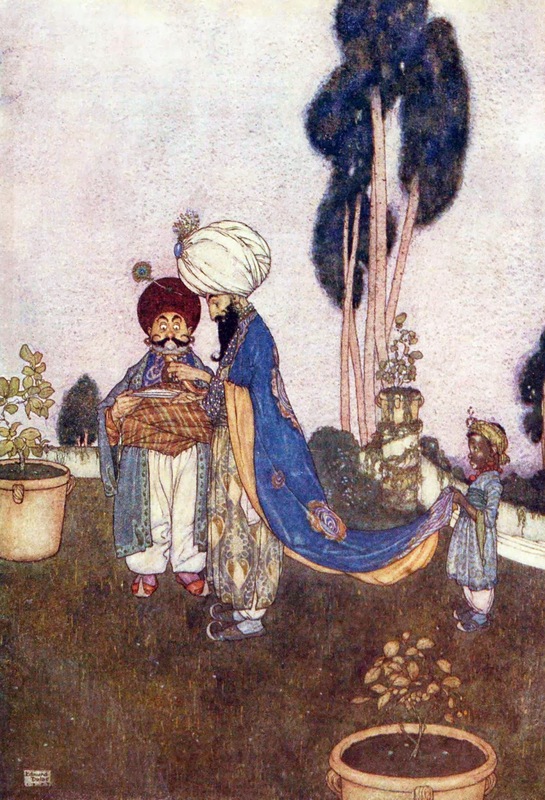 After the war, the deluxe edition illustrated book became a rarity and Dulac's career in this field was over. 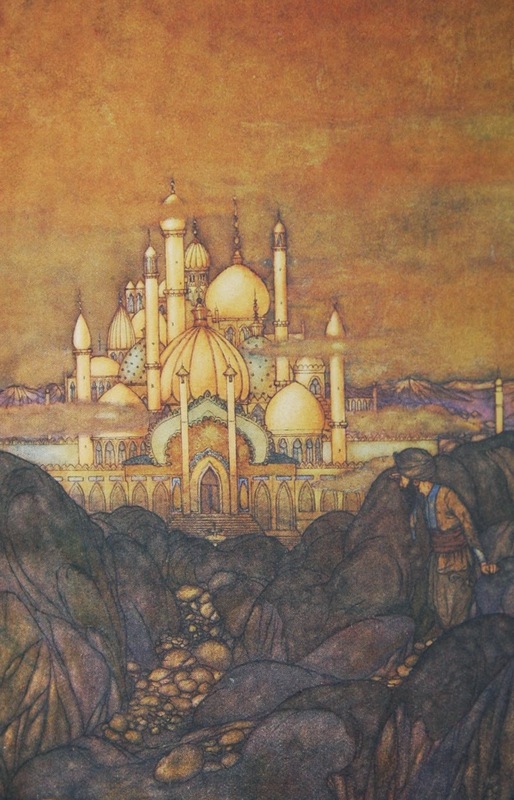 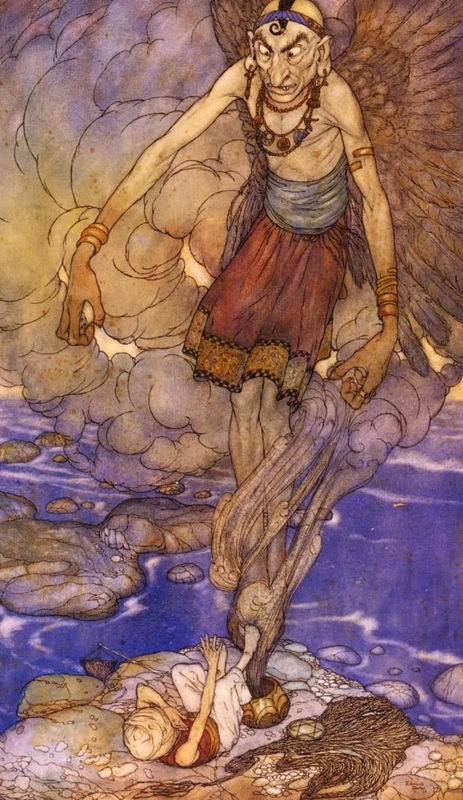 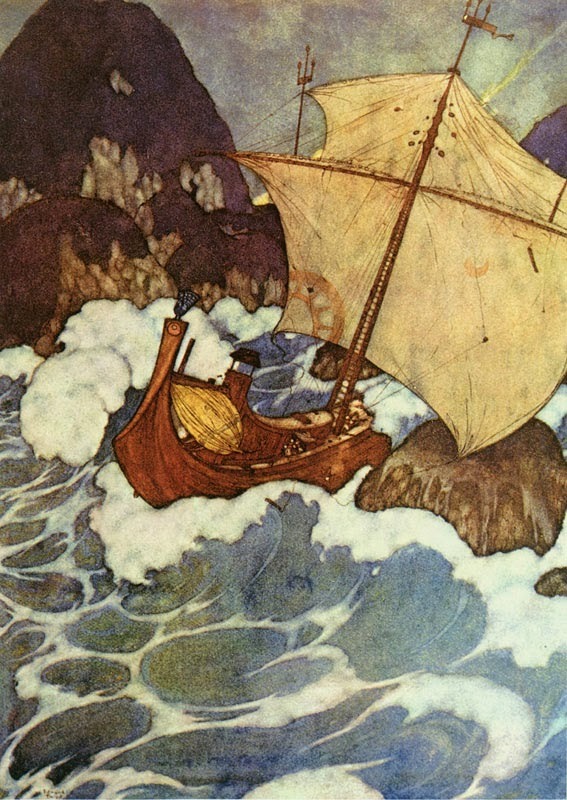 His last such books were Edmund Dulac's Fairy Book (1916), the Tanglewood Tales(1918) (including 14 colour images) and the The Kingdom of the Pearl(1920). 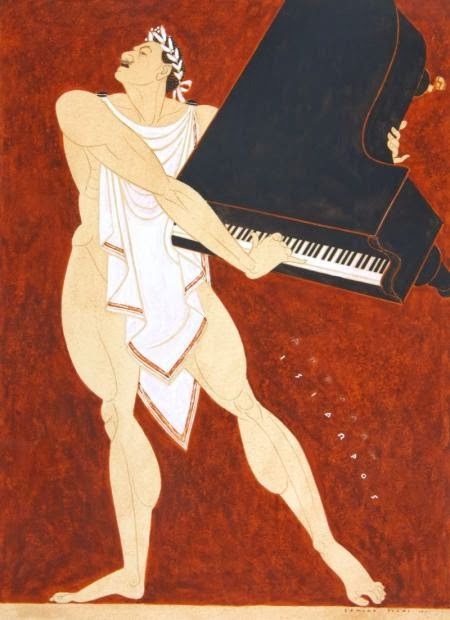 His career continued in other areas however, including newspaper caricatures (especially at The Outlook), portraiture, theatre costume and set design, bookplates, chocolate boxes, medals, and various graphics (especially for The Mercury Theatre, Notting Hill Gate). 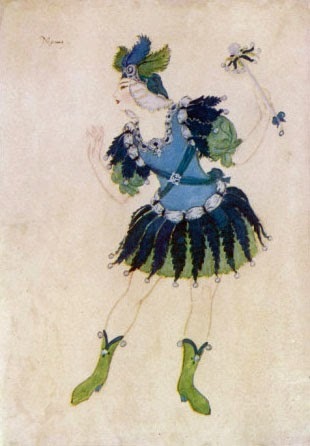 Costume design for the character of Momus in the opera "Phebus and Pan"
He also produced illustrations for The American Weekly, a Sunday supplement belonging to the Hearst newspaper chain in America and Britain's Country Life. 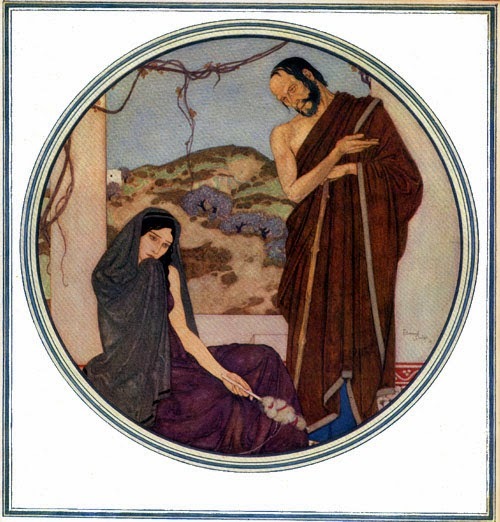 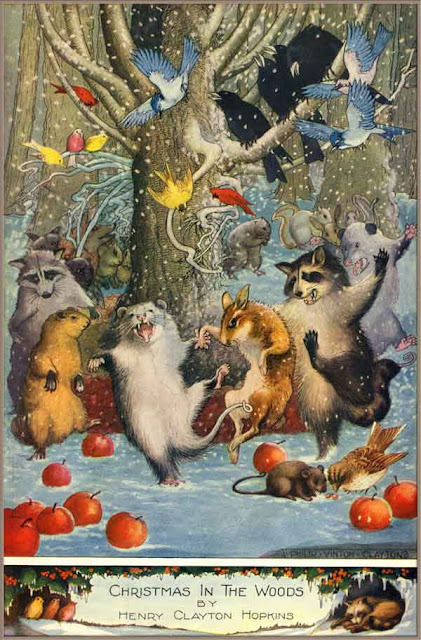 Country Life Limited (London) published Gods and Mortals in Love (1935) (including 9 colour images) based on a number of the contributions made by Dulac to Country Lifepreviously. 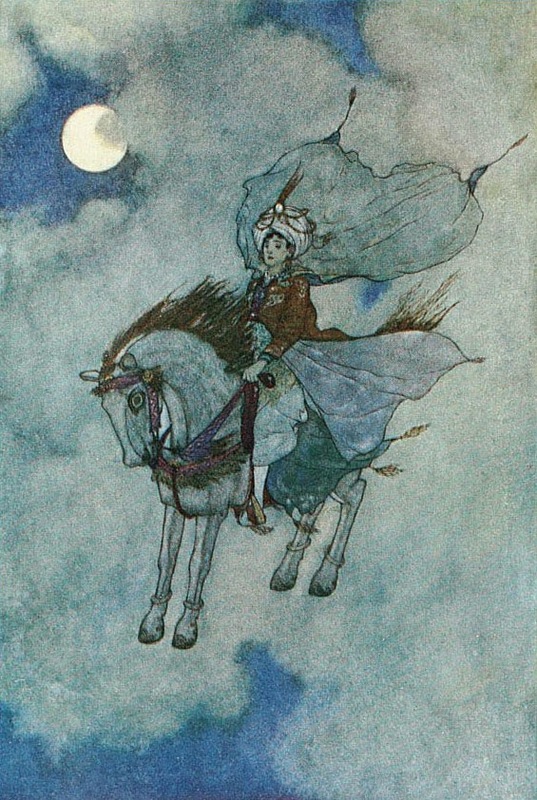 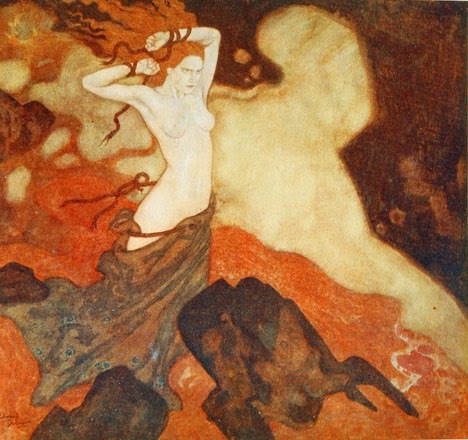 The Daughter of the Stars (1939) was a further publication to benefit from Dulac's artwork - due to constraints related to the outbreak of World War II, that title included just 2 colour images. 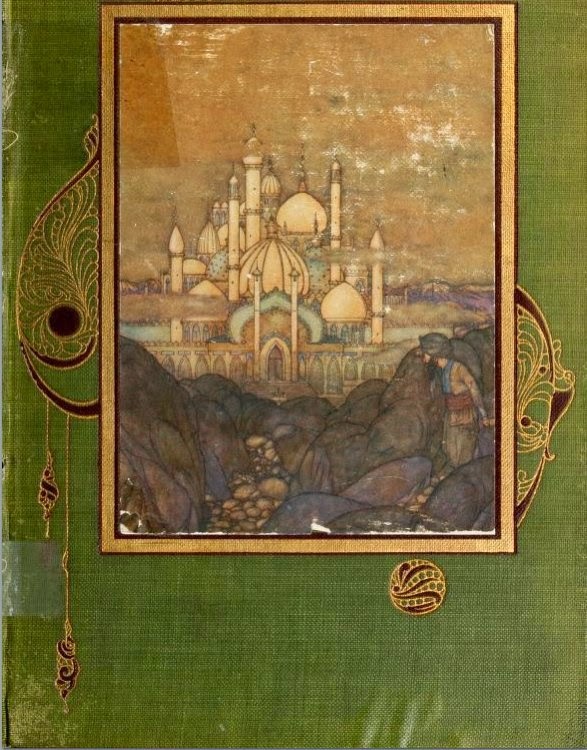 He continued to produce books for the rest of his life, more so than any of his contemporaries, although these were less frequent and less lavish than during the Golden Age. 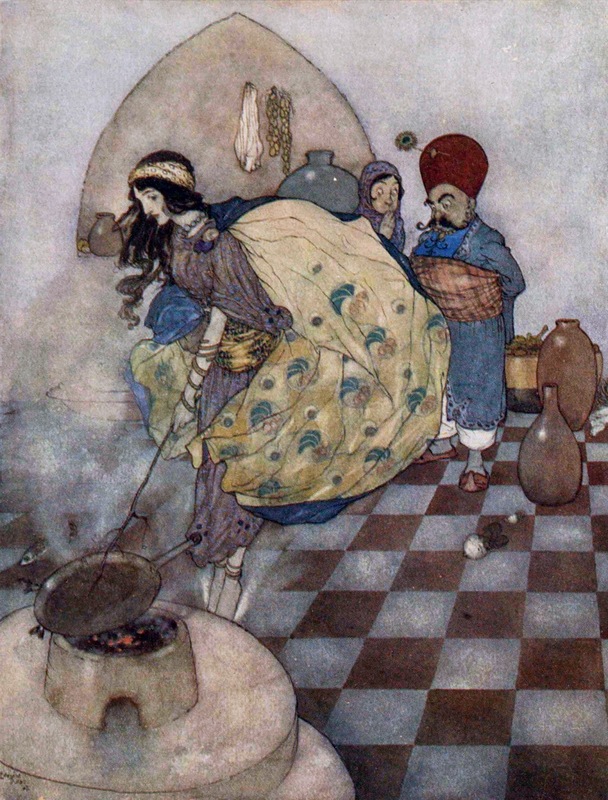 Halfway through his final book commission (Milton's Comus) Dulac died of a heart attack on 25 May 1953 in London. 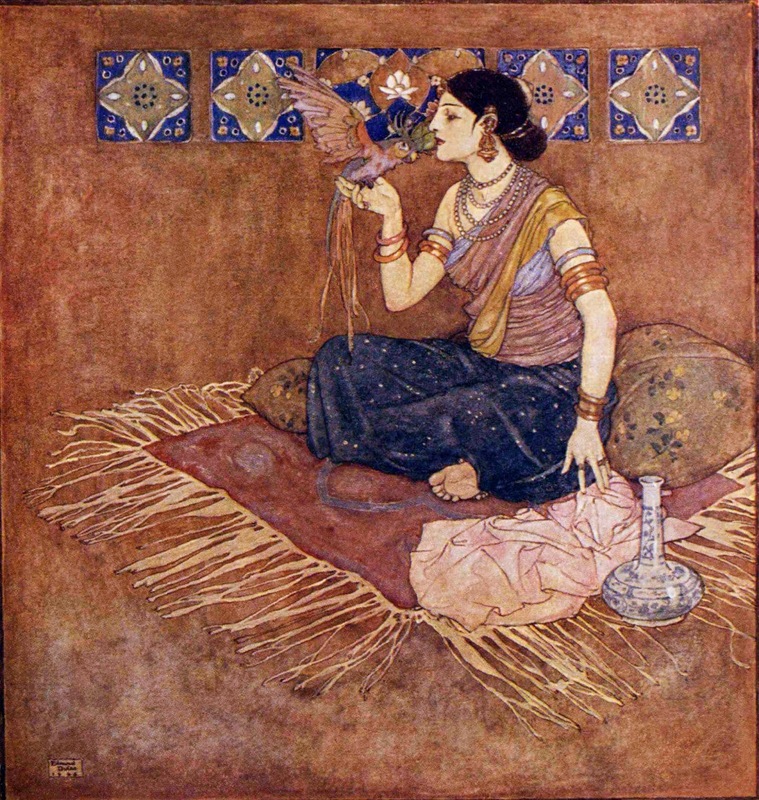 Biographical notes adapted from Wikipedia. 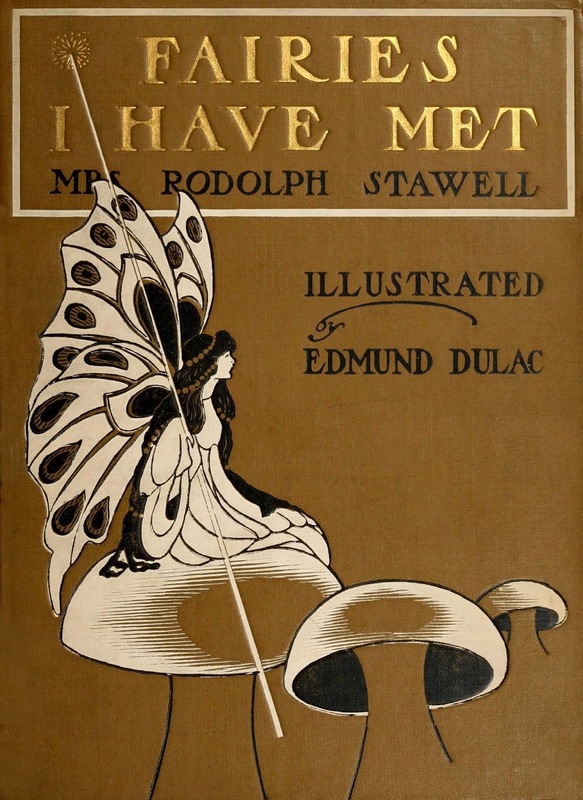 The first children's book to be illustrated by Dulac was Mrs. Stawell's "Fairies I Have Met”, originally published in 1907 and later reissued in 1920 as "My Days with the Fairies”. 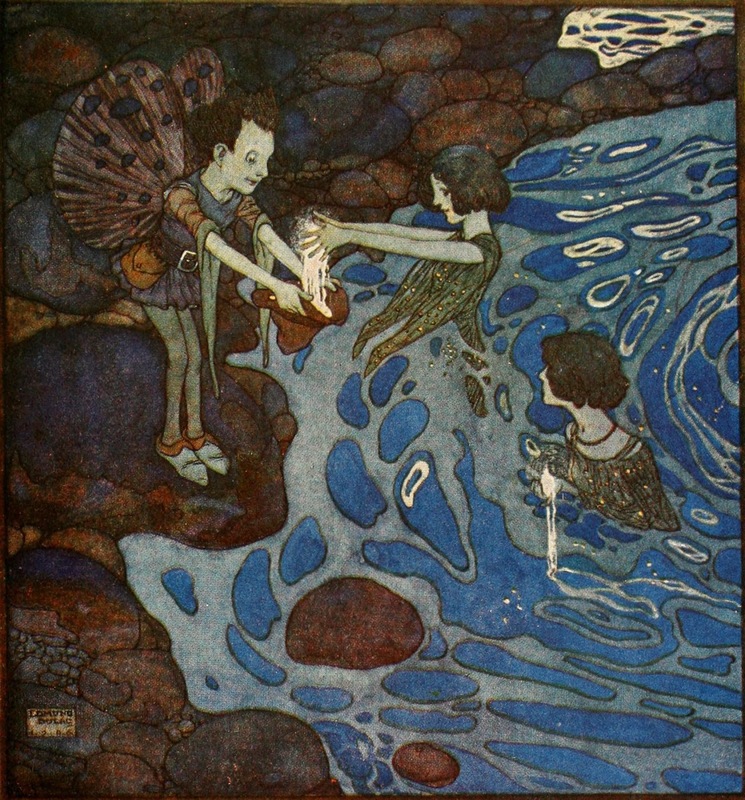 The Sea-Fairy and The Land-Fairy "He held out the little shell in the beam of coloured light." 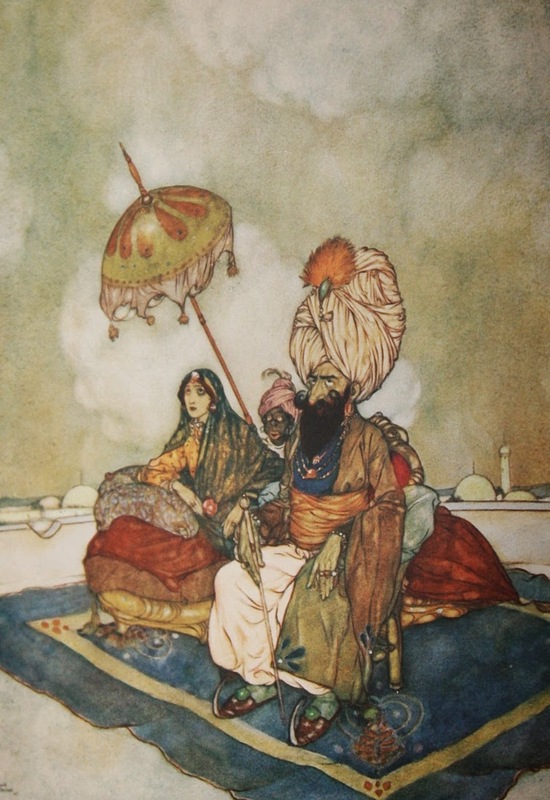 Princess Orchid's Party "She smiled at him very graciously when he was introduced to her." 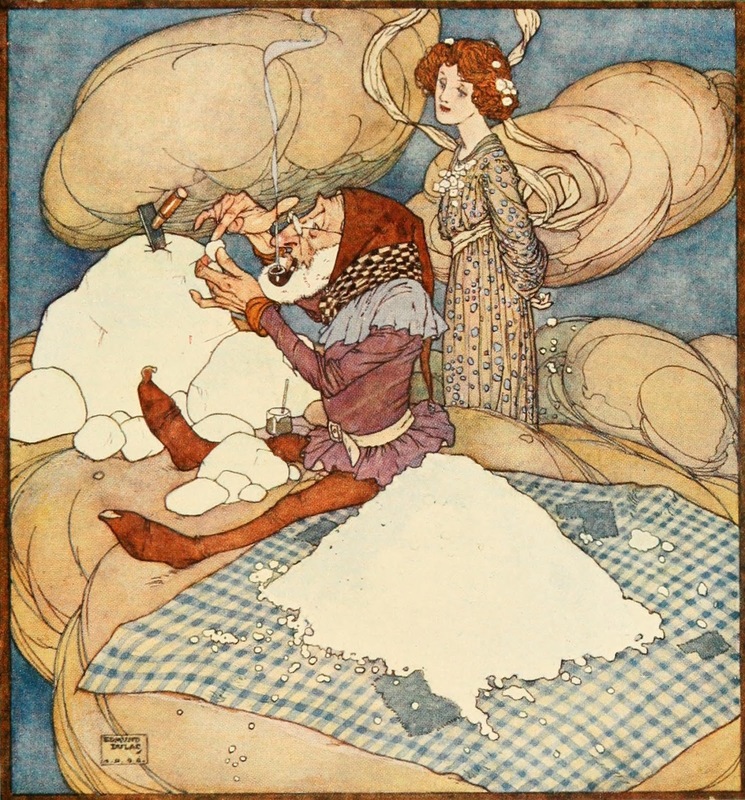 The Cloud that had no Lining "And because the silver of the moonshine-fairies is very light he was able to carry a great deal of it." 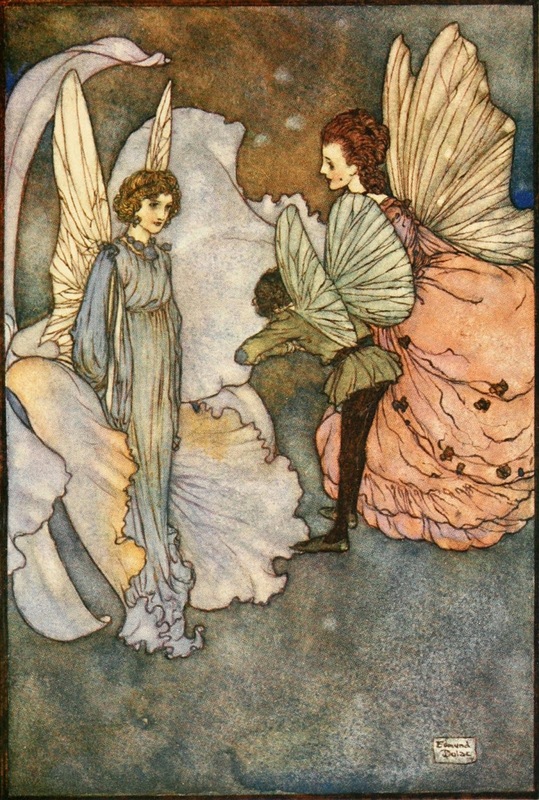 The Fairies who changed Places "Drop-of-Crystal was too busy to speak." 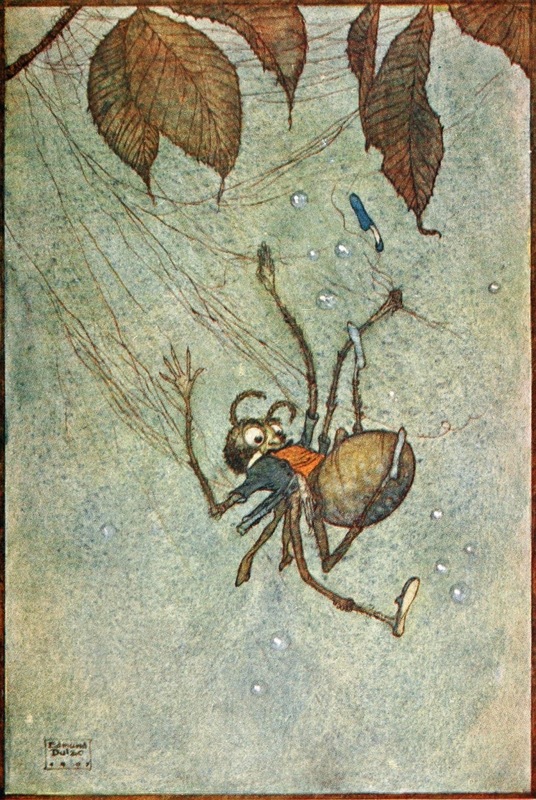 The Big Spider's Diamonds "The web and the diamonds and the Big Spider himself all fell to the ground." 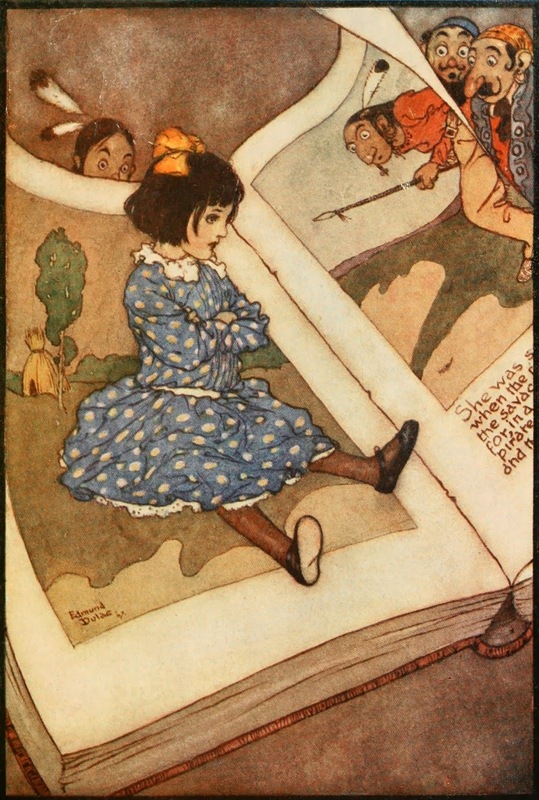 A Little Girl in a Book "The other people in the book looked at her in surprise." 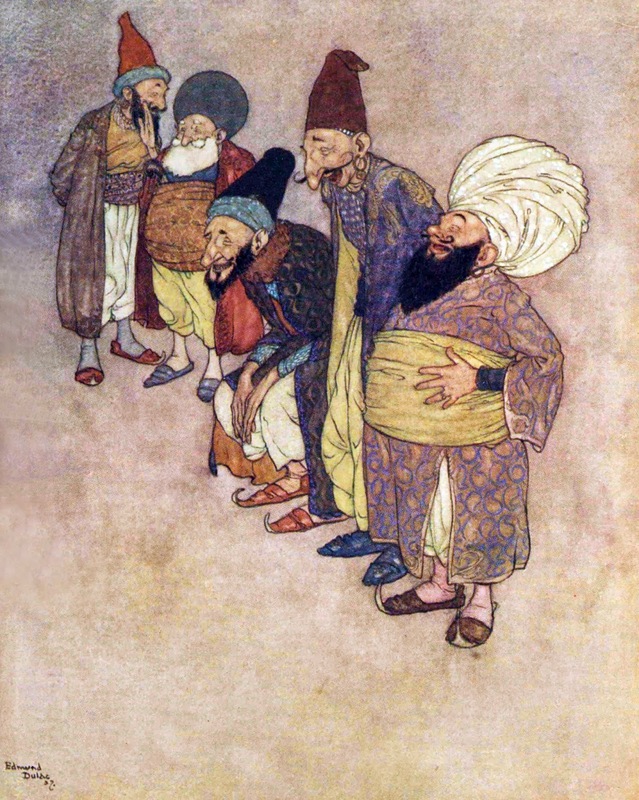 Their chief in a low but distinct voice uttered the two words, "Open Sesame"